In episode four of the much maligned season two of True Detective, writer Nic Pizzolatto made an odd reference to one of Los Angeles’ more notable moments of transit conflict. As a bevy of cops and the doomed trio of detectives walked into a hail of gunfire and official cover up, behind them dozens of Angelenos picketed city transit service reminiscent of the Bus Riders Union in the early 1990s. Judging from the demonstration the issues aggrieving ridership remained much the same: overcrowded buses, poor service, and a failure to serve working Angelenos. When nearly all the protesters end up dead as the nearby police raid goes so very wrong, one might draw some negative conclusions regarding Pizzolatto’s view of Los Angeles bus service and its patrons. Then again, as numerous commentators have noted, very few people really knew what was going on in the second season as its nourish elements subsumed clear story telling; who knows what Pizzolatto’s aim was in this regard. 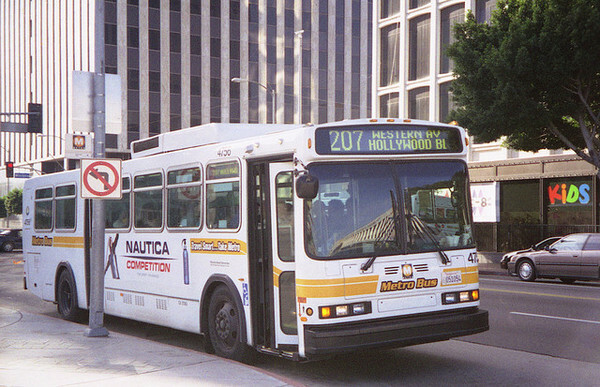 Ultimately, the dozens of dead and injured protesters that served as human collateral driving home the desperation of the show’s three main characters, however flawed, in many ways symbolizes debates about bus transit in LA and elsewhere: critical to city fortunes, but treated as an afterthought by planners. Since former Mayor Tom Bradley’s late 1960s efforts to find funding for a subway and Kenneth Hahn’s successful advocacy for and eventual construction of the Blue Line, rail transit has dominated debates and funding streams regarding the expansion of L.A.’s transportation infrastructure. Yet, during these debates the city’s bus system bore the lion’s share of ridership, while receiving a paucity of funding. While today’s Metro Orange Line Bus Rapid Transit might not be wholly a result of these efforts, no doubt it benefited from these debates, and with new discussions regarding the possible conversion of the Orange Line to rail, today serves as the perfect opportunity to examine the city’s recent bus history, the attitudes that underlie bus transit, and its present and future. 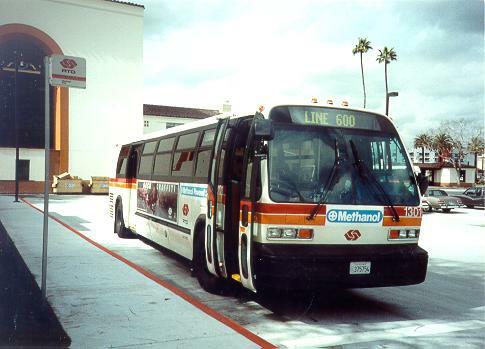 When Kenneth Hahn brought Proposition A to the public in November of 1980, he purposely included the bus system within its funding mechanism. Though he wanted to build the Blue Line light rail, he knew that earlier initiatives in 1968, 1974, and 1976 had failed because they had forgotten about bus riders. The general public would never approve spending for rail transit alone if it didn’t include buses. How did the BRU and LDF demonstrate this alleged racial bias? Using MTA data, LDF lawyers noted that 80 percent of bus riders were people of color, while in the county less than 60 percent of the population were minorities. According to the same data, by 1993, whites made up 73 percent of Metrolink riders. Though Metrolink makes up less than 2 percent of the MTA’s annual budget, in 2002, MTA funding to the regional rail system accounted for $37,000,000; roughly four years later the expenditure increased to over $40,000,000. On September 1, 1994, Judge Terry Hatter ruled for a temporary injunction in favor of the BRU and LDF. Though the order merely delayed a more permanent injunction, the ruling severely damaged the MTA’s position and strengthened the BRU’s position as new supporters came to the fore, including numerous conservative scholars who questioned the efficacy of rail transit. Harry W. Richardson and Peter Gordon, right of center USC scholars, contacted the anti-capitalist BRU, making the coalition fighting the fare increase and rail transit one of the more bizarre sets of bedfellows in recent Southern California history. Hatter wanted the MTA to negotiate with the BRU and LDF, and even lifted the injunction to allow for a fare increase for the daily pass but kept the monthly pass injunction in place. The LDF encouraged the MTA to settle — after all, the case remained about improving service and bringing tangible results for the city’s most vulnerable workers. Moreover, a lengthy trial could take years, carried financial costs, and didn’t necessarily guarantee any real improvements. The LDF agreed that the load factor provision would be ultimately beneficial to the cause and encouraged the BRU to accept the MTA’s proposal. However the BRU wanted to convict the MTA of civil rights violations, proving it racist and thereby airing all the evidence to the public. The BRU split with the LDF and retained only the SCLC as its plaintiff. It subsequently lost, as two years later in August 1996 Judge Hatter agreed with the LDF and ordered what became known as the consent decree into action. The decree itself more or less stabilized fares through October of 1998 and limited fare changes in accordance with the consumer price index from 1998 to 2003. As noted, it also sought to ensure that overcrowding in buses would decline due to the load factor; if this metric increased, then the MTA would have to purchase new, energy efficient and more environmentally sound busses. For the next decade, issues raised by the BRU’s protest, the ramifications of the consent decree, and skepticism from some Angelenos regarding light rail contributed to debates and ideas regarding local transportation options. One could argue that these debates made more likely the eventual adoption of a new bus service in the San Fernando Valley, which combined the best aspects of bus systems with the benefits of a light rail model. 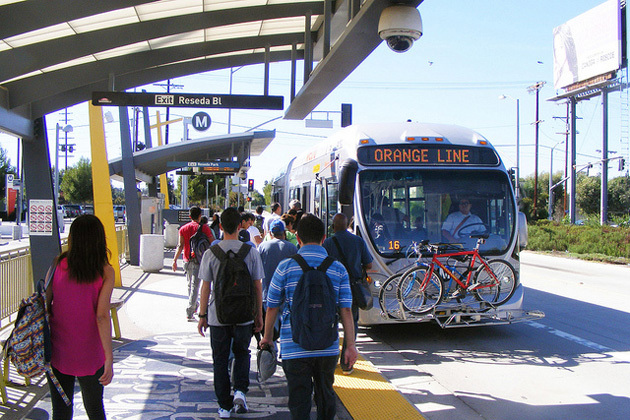 In October 2005, San Fernando Valley’s Orange Line Bus Rapid Transit (BRT) opened, which over time emerged as a celebrated part of MTA’s larger transit policy. “It’s much easier to ride this than it is to drive,” Gale Johnson, a retired security worker in San Fernando Valley, described the Orange Line 2012. “It’s like a train on wheels.” 17 L.A. County Supervisor Zev Yaroslovsky designed it on the back of a napkin after touring Curitiba, Brazil’s own BRT in 1999: “it took me thirty seconds to say this will work on the Southern Pacific railroad tracks’ along Chandler Boulevard”. The MTA completed the Orange Line route in 2005, which at the time included 13 stations with five miles of sound walls, anti-graffiti coating, and rubberized asphalt. The agency also planted 5,000 trees and 800,000 plants, all efforts to beautify and reduce noise pollution along the route, which took two years to complete and cost $330 million. Rail transit would have taken longer and cost much more. Yet, as evidenced by Gale Johnson’s comments, the Orange Line’s success as a form of public transit rests in part on its resemblance to light rail. Some Valley residents pined for rail transit, like Northridge’s Charles Rozner, who argued that the MTA built the Orange Line because of “myopic politicians who could not see further than the original cost of construction.” Other residents, like Valley Village’s Jack McGrath, cautioned observers to not let the perfect be the enemy of the good. The Orange Line, he wrote, “will give thousands of commuters a safe, quicker alternative for work or play. 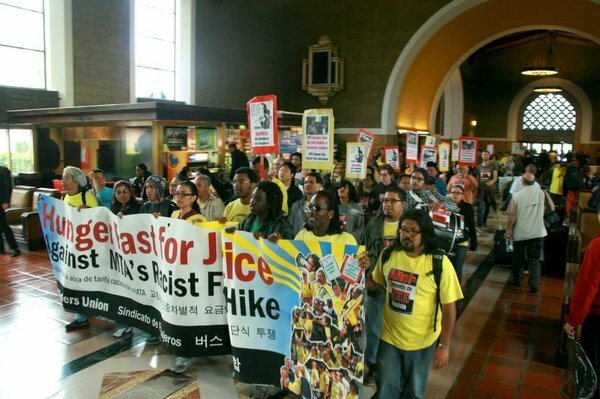 It is not light rail or subway, but it is one small step to help make Los Angeles a more livable city.” Serving schools like Valley and Pierce Colleges and communities like Reseda, the BRT certainly provides significant numbers of Latinos, Asians, and blacks quality public transit — a central goal of the BRU’s 1990s protest. As noted above, how much of the Orange Line’s creation can be credited to protests like those of the BRU is certainly debatable. Even without the BRU, many Valley residents chafed at the idea of a light rail or subway as did many of its political leaders. Yet, the BRU’s efforts did force the MTA and others to think about public transit from more than just a rail perspective. The Orange Line merges aspects of bus and rail transit and appeals to pro-rail sensibilities while delivering arguably cheaper service, though outside of construction costs, even experts debate this last point. Also, like the Blue Line, the Orange Line and other BRT lines depend on right of ways established under earlier rail transit such that even Yaroslavsky and MTA officials admit that with few rights of way left, future BRT’s may not be possible. 23 In the end however, nearly twenty years since the consent decree and almost ten since the Orange Line’s debut, L.A. transit seems be getting better and perhaps more equitable too. Even if bus riders end up as tragic background noise in HBO television shows, at least they are now given a role. Maybe next time, they can be more than fodder for tales of neo-noir Los Angeles’ that too, perversely, would be progress. A version of this article appeared on the KCET Departures website under the Intersections column in May 2015. Next I Have a PhD in History. How Can I Survive in the Private Sector?
. . . either that or maybe, when given a choice, sensible people of all tones just prefer the “surface subway” approach of BRT to the “slog along in traffic and ring the bell every block” approach of traditional buses. Transportation is becoming yet another information technology and everything we think we know and expect will change. Executed properly, BRT is the best form of mass transit for the networked world – better even than *gasp* rail because of lower cost and adaptability. That said, it will take time to perfect BRT. This article was very inspiring. Thank you. While it’s certainly true that a comparatively modest outlay could significantly improve service on the Orange Line without the cost of LRT conversion, I remain unconvinced that the level of service would rise to anywhere near what could be provided by rail. However much you improve a busway, the performance of ICE-driven buses is still limited by their poor acceleration performance. Maybe we should consider converting the Orange Line not to rail, but to a trackless trolley configuration in which the vehicle runs on rubber tires, but relies on overhead traction like a tram or LRT train. I’d like to think that the Metro board has at least considered fact-finding trips to San Francisco, Vancouver BC, or any other major city where trackless trolleys remain in use.